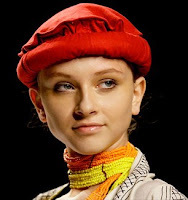 I was very surprised when my dad told me that there were South Asian designers on the catwalks of Milan Fashion Week (yes, I know that was way back in September). I do like South Asian Fashion, so was very interested to see what they came out with. I tend to only wear traditional clothes at weddings, and am always looking for ways to modernise them. I always find it really uncomfortable to wear them for more than a few hours at a time, so I happily welcome any modern and comfortable ideas for them. 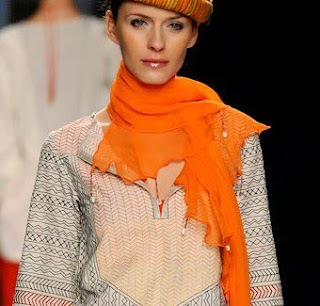 They were being showcased in Milan on the 30th September 2009, as part ‘N-U-DE New Upcoming Designers Project’, launched by Camera Nazionale della Moda Italiana to enhance international designers. I'm looking at three designers that were there: Deepak Perwani, Maheen Khan and Rizwan Bey. These first pictures are from Deepak Perwani. The colours and styles of his clothes are magnificant. I googled him a while back and some of his collections are fantastic. And finally, these ones are from Rizwan Bey. They have to be my favourite from all of the collections. Which ones are your favourites and are there any out of these 3 designers that you'd like me to research some more? All pictures from Dawn Newspaper. LOVE the Rizwan Bey collection, it's so beautiful! & I really like all the vibrant colours in the Deepak Perwani collection too. I would love to seem more of that first Maheen Khan piece. Is it a dress or top? The print is stunning! 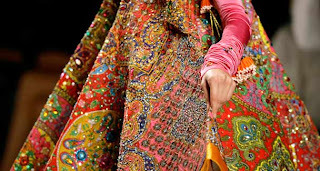 i love south asian fashion, the colors are always so VIBRANT and the styles so LOUD! ;P love it! I love ethnic pieces but never know how to wear them! Thanks for the comment on my hair! I got a lot of good advice and feedback, so it was very helpful! 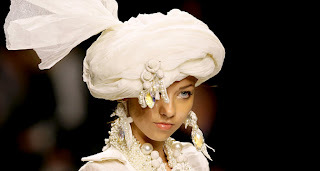 I like Rizwan Bey's collection the best. Something about the white looks elegant and whimsical and makes me think of snow and Christmas! Which I am so ready for! Well, Christmas, actually not really the snow! I like the way snow looks but not having to drive in it! Beautiful! 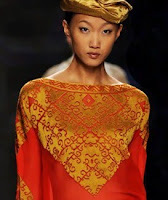 I've always loved the embroidery and intricacy of Southeast Asian garments, but I can imagine it's not for everyday wear. All of these are so gorgeous and good modern takes on the look. I love the Rizwan Bey ones, just because I think they would match any wardrobe but are special enough to make a statement! Simply stunning! I love the first collection because the colors are rich and beautiful. I love the last collection b/c of its edge and uniqueness. I would love to learn more about those two designers! I love them all but my favorite judging from these photos is Deepak Perwani. Love the colors and the designs. So WOW to the max! how beautiful! I love the Rizwan Bey stuff. These are all stunning Sherin, but I think my favorite is the Deepak Perwani collection. I'd be interested to hear your investigation into any/all of these, particularly since they relate directly to your own interaction with parts of your heritage and what you file under 'tradition'; it's always interesting to hear people's opinions on design and aesthetics but discussion coming from the perspective of "this garment sort of belongs to me, how do I/can I make it work for me" really makes me sit up and go: Ooooh, fascinating. It'd also particularly appeal because I'm far more used to seeing non-Eurocentric clothing being reinterpreted by British/American/French/Italian designers. Your mention that these are South Asian designers working with South Asian motifs sounds miles more interesting, frankly. I like Deepak the best just because the color, but the last designer is also amazing. What a unique take on style, I like it! i love that first designer. amazing colors. Oh I just love South East Asia's gorgeous, vibrant, beautiful clothing! My only complaint is the lack of diversity on that runway! Tisk Tisk to the casting director! Hahaha After all, those raven-haired, absolutely and impeccably stunning Asian models would have made those clothes look ten times better... but that is just my opinion. I love all the details and the bold color! I think that it is always fun getting to know more about international designers! Wow, these runway pictures are beautiful.